The impressive façade of the Shangri-La Hotel Vancouver. The Shangri-La Hotel Vancouver is something of an anomaly in this vibrant Canadian city, at least, that’s what I soon discovered. Located in an impressive 62-storey tower of glass and steel, British Columbia’s tallest building, the Shangri-La Hotel may look daunting from afar but once you step through its doors, a completely different experience awaits. As the taxi navigated the streets of downtown Vancouver, the driver pointed at a gleaming tower, “That’s your hotel.” I looked out the window and up – the tower, with its pointy edges on one side and a smooth flat surface of glass on another, seemed to touch the sky. I immediately had visions of a massive atrium lobby with hanging gardens, crystal chandeliers and nuggets of Oriental art. As we approached the hotel, the taxi driver turned into a rather unassuming driveway which led us down into the basement. I stepped out of the taxi and the friendly doorman welcomed me before ushering me inside. On my left was a modest lounge and on my right were two neat desks. I was confused. Where were the atrium lobby and hanging gardens? The well-coiffed receptionist swiftly checked me in and within minutes, I was whisked up to my room. I was still feeling rather bewildered (perhaps it was jet-lag; I wasn’t entirely sure) when I entered my room. The second I opened the door, I breathed a sigh of relief – oh yes, this is the Shangri-La I’m familiar with! My room at the Shangri-La Vancouver. The room was just gorgeous. Walls of glass showed off the view of downtown Vancouver. There was a plush sofa, coffee table and a well-equipped writing desk in one corner, and a comfortable king-size bed in another. A door opened out to a small, partially-enclosed balcony. I particularly liked the bedside control panels and the night light which cast a soft glow on the floor. The marble-floored bathroom was of a good size, with a separate shower cubicle, bath-tub, toilet and attached balcony. The contemporary yet warm, homey feel of the room was a delight! The spacious bathroom. The door leads to a partially-enclosed balcony. Over the next few days, I became more acquainted with the hotel. I dined in Market by Jean-Georges, the hotel’s elegant restaurant, and I indulged myself with a spa treatment at the beautiful Chi, The Spa. 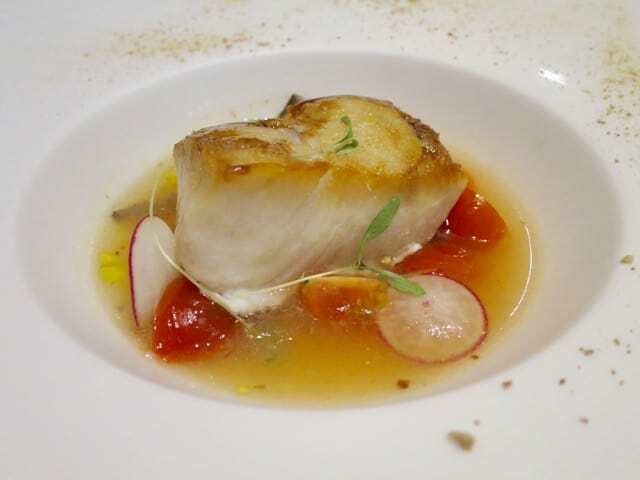 The exquisite cuisine at Market by Jean-Georges features many local, seasonal products. The Chef’s Menu, a surprise 7-course dinner, is a real treat. Chi, The Spa, is a spa within a spa. Each treatment suite has its own shower cubicle, bath and fireplace! Unlike many other Shangri-La Hotels I’ve visited, this one felt very private and boutique-like. I discovered that, despite being located in such a massive building, the hotel only has 119 rooms (on the first 15 floors). I found the atrium lobby on the ground floor (street level) – not quite the dimensions that I had envisioned but I realised that the street-level lobby and the reception area on the lower level both contribute to the private, boutique-like feel of the hotel. Each time I stepped into the hotel from the bustling streets, I felt like I’d entered a blissful oasis, the very definition of ‘Shangri-La’. One factor that is consistent with other Shangri-La Hotels I’ve visited is the high level of service. The staff at the Shangri-La Hotel Vancouver are no exception. Throughout the hotel, from housekeeping to the restaurant staff and the concierge, I was greeted with a warm, sincere smile and I experienced seemingly effortless but highly attentive (or rather, intuitive) service. The staff never failed to make me feel right at home. The Shangri-La Hotel Vancouver is located in the heart of downtown Vancouver, just a few minutes walk from Robson Street (famous for its shopping) and a few blocks from the Vancouver Waterfront and Convention Centre. If you’re an early-riser, go for a stroll or a jog along the waterfront to Stanley Park for simply stunning views of the harbour and the surrounding mountains. A morning stroll along the waterfront is a fabulous way to start your day! With its boutique-like ambiance and gracious staff, I felt very much at home throughout my stay at the Shangri-La Hotel Vancouver. This oasis in downtown Vancouver is truly a gem! Read about things to do in Vancouver. Read about my recommendations for some of the best restaurants in downtown Vancouver. Note: a big thank you goes to Shangri-La Hotel Vancouver and Destination British Columbia for your fabulous hospitality. As always, all views expressed above are mine and mine only. Looks really nice, I’ll definitely keep that hotel in mind when visiting Vancouver next April. So far my only Shangri La -experience is from Hong Kong, which is also an excellent hotel – though not my first choice in HK. But anyway, thanks a lot for the article! Amazing photos, I love the one of your lounge – spectacular! I’ve recently been to Shangri La in Chiang Mai, Thailand – truly amazing too – jaw dropping hallways, interior and a swimming pool – this is how luxury should be! Hi Keith, Nice post Shangri La’s are always in my list and I love to stay at Shangri La’s, and I would suggest you to check Shangri La Istanbul aswell, it is about 1,5years old nice hotel at the unique Bosphorus. Will keep Vancouver Shangri La in mind mind for my next trip. Thanks for your comment. I had a fabulous stay at the Shangri-La. I especially loved its boutique feel despite being located in the city’s tallest building. Love the Shangri La Vancouver – looks like you had a great stay!